Rock your business with one simple, inexpensive tool! Mastering all the tools you’ve got is sucking up your time, and you’re not making the best use of them. You feel lost in all of the options. Everyone’s always talking about this must-have-tool or that one. You can’t figure out what you truly need. You’re spending hundreds—if not thousands—on tools that aren’t really making your business run smoothly. You want to run your business, but here’s the truth. You’re being run over by your business. It feels terrible. You’re frustrated, disillusioned, and on the verge of exhaustion. I specialize in helping small business owners just like you run their businesses with efficiency and ease. The fact of the matter is that small business owners don’t always need the same expensive tools that bigger companies use. Some online gurus will claim that you have to use all these expensive task and project management tools and all sorts of other software programs and gadgets. You don’t—not now, at least. What you really need is a simple, inexpensive tool that you can master in minutes. Evernote is the answer to your prayers. You can easily turn Evernote into your go-to tool for managing your business, increasing your productivity, and getting your clients great results. Here’s how. . . .
Evernote is an amazing and inexpensive tool. You might even be able to stick with the free version of it. It’s revolutionized the organization of my clients’ businesses. . .as well as my own. I created Evernote for Small Business so that you can optimize your business operations, save money, and flourish. After working with Natasha I have a system in place for pretty much everything – my email, my financials, my client intake process and my program launches. Overall, I’m about 200% more efficient than I was before working with her! I’m meeting goals and milestones that I used to only dream of. Evernote for Small Business is a guide that. . . . There is nothing out there on the market that provides you with this kind of comprehensive and systematic approach to using Evernote for your business. 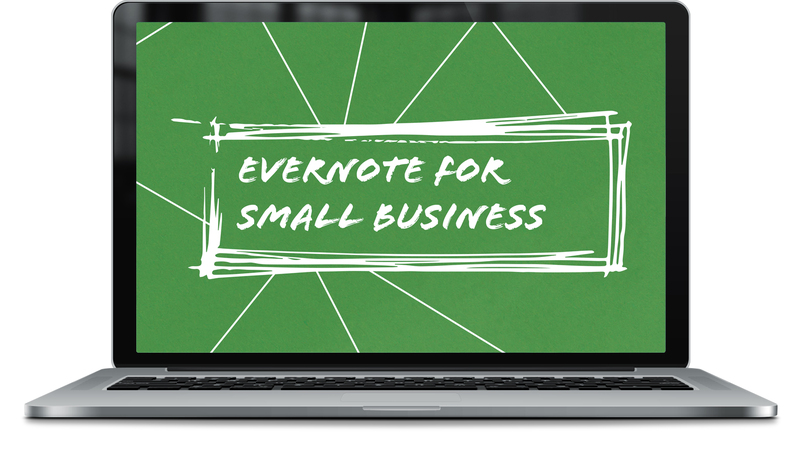 Evernote for Small Business is specially designed for small business owners. Like tons of entrepreneurs, I have Evernote on my desktop, on my phone, everywhere — I even pay for the premium version! — but don’t really use it for much more than collecting articles. I know it’s a robust tool, but I never had the patience to figure it out. Enter Natasha and the wonder that is Evernote for Small Business. Ta-da! It’s brilliant. In the time it took me to ingest my caffeine for the day, I was able to work through the basics of setting up a system and getting myself organized. From there, with a little more time and attention, Evernote for Small Business showed me tons of tricks and tips for managing files, emails, an endless array of random notes + links — and my favorite part — to do lists. I’m stoked to finally be putting Evernote to proper use! You’re not entering yet another course or program. You’re getting an all-in-one guide that teaches you exactly what you need to do to optimize your use of Evernote. It’s going to be fast and easy. I’m giving you all of the Evernote templates I’ve created. You can use them exactly as they are or modify them to suit your specific needs. Your $57 investment in the guide can save you hundreds—even thousands—of dollars this year because you’ll be able to get rid of costly tools that you don’t actually need! Before I got Natasha’s Evernote for Small Business, I’d been using Evernote for about two years. I loved using it to clip articles I found on the Internet. But I’ll be honest. My Evernote was a hot mess. I had thousands of notes and a couple of notebooks and stacks, but I never consistently organized things. It really was just a dumping ground. Thanks to Natasha’s guide, I was able to quickly organize my Evernote and start using it to manage the day-to-day operations of my business. It’s a huge relief! Evernote for Small Business has given me so much value: I’ve tamed my out of control notebook habit into usable stacks; I’m storing and actually accessing usable data (I’m guilty of clipping and never looking at it again); I’ve edited all my tags into a consistent format. I’m using [the guide] not only for business, but also home life. The videos have given me just what I needed–to see how another entrepreneur organizes and practical use-cases for Evernote. Thank you!! YOU’RE GOING TO. . . Finally crush the chaos and streamline your business. Feel happier, more relaxed, and more present. Have more fun—in your business. . .and beyond it! Evernote for Small Business is yours for $57.